Erachi pathiri with a different style than the traditional one. 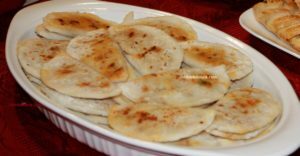 The authentic recipe includes frying puris stuffed with spiced meat preferably in circular shapes,dipping the fried puris in light sweet egg mixture and then shallow frying the egg coated fried puris. I had to alter the tradition to fit my style to make it more healthier so that I could munch on few more guilt free pathiris. My recipe includes rice pathiris with meat filling folded and then pan fried. A three step procedure cut short to one step process similar to panfried Meen Pathiri.Cooking Erachi Pathiri made easy and tasty. Enjoy! 1.Heat oil in a frying pan and saute onions, minced ginger, garlic & green chili with a pinch of salt. Stir and cook till translucent or golden brown. 3.Add curry leaves, turmeric powder, red chili powder and coriander powder stir. Also add in the shredded beef. Sprinkle garam masala and roast for 5 to 10 minutes and remove from heat. This forms the “Erachi Pandam” (meat filling) that goes between the folded layers of pathiri or pathil. Keep aside. 1.Grind the coconut,shallots and fennel seeds with little water into a coarse paste. Keep aside. 3.Switch off the heat and stir in the ground coconut mixture.Slowly transfer the contents into another flat vessel and let it cool for 5 to 10 minutes. 4.Knead it to a smooth dough using hand without adding water.Make it into small lime sized balls. 5.Press or roll each of balls into circles by spreading rice flour over the balls.This can be done using a chapathi press or chapathi roller. 6.Place a spoonful of filling in the center of each circle. Gently fold the circle into a semicircle. Seal the edges with a little water. 7.Pan fry each semicircular pathiris on both sides. 8.Serve it as an appetizer or snack.